Cook is expected to sign with the Saints, Ian Rapoport of NFL Network reports. Analysis: Cook left New Orleans unsigned after visiting with the team last week. While it isn't clear if the tight end has visited other potential suitors since then, it's becoming clear the tight end has decided on the Saints to continue his playing career. Should Cook ultimately put pen to paper, he'll provide Drew Brees with a nice upgrade at the tight end position -- at least from a receiving perspective. Cook remains unsigned after visiting with the Saints last week, Sheil Kapadia of The Athletic reports. Analysis: While no other visits have been reported, Cook surely is drawing interest from multiple teams as the top tight end on the market. A return to Oakland also would make sense given that the Raiders haven't lined up a replacement. Heading into his age-32 season, Cook should sign a contract soon enough. Cook will visit with the Saints on Thursday, Ian Rapoport of NFL Network reports. Analysis: Cook proved that he had plenty to give in two campaigns with the Raiders. Overall, he totaled 122 catches (on 187 targets) for 1,584 yards and eight touchdowns in 32 games. 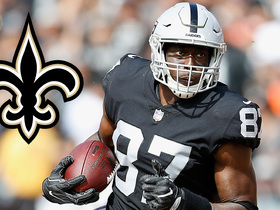 Tight end is a need in New Orleans following the retirement of Ben Watson, so if Cook does land a contract in the coming days, the soon-to-be 32-year-old would benefit in the upgrade from Derek Carr to Drew Brees. Raiders coach Jon Gruden said he would like to re-sign Cook this offseason, Scott Bair of NBC Sports Bay Area reports. Cook caught three of five targets for 28 yards during Sunday's 35-3 loss to the Chiefs. Cook (ribs) does not carry an injury designation for Sunday's game against the Chiefs. Analysis: Cook, who was limited at practice all week, has logged back-to-back subpar efforts. Prior to that, though, he recorded seven receptions twice in a row. After catching a fantasy-friendly 65 passes for 868 yards and six TDs in 15 games to date, the tight end profiles as a bounce-back candidate Week 17, assuming his rib issue isn't a major hindrance. Cook (ribs) remained limited at practice Thursday. Analysis: Back-to-back practices -- albeit in a limited fashion -- would seem to pave the way for Cook to suit up for Sunday's season finale against the Chiefs. We'll revisit the tight end's status Friday to see if he's listed as questionable for that contest, or is removed from Oakland's Week 17 injury report altogether. Cook was limited at practice Wednesday due to a rib injury, Michael Gehlken of the Las Vegas Review-Journal reports. 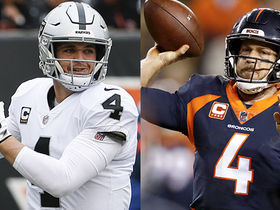 Analysis: Cook's limitations come after he played 34 of the Raiders' 62 offensive snaps in Monday's 27-14 win over the Broncos, during which he hauled in two of three targets for 20 yards. He's logged back-to-back quiet efforts, but prior to that, Cook reeled in seven passes twice in a row. He'll be a bounce-back candidate in Week 17 against the Chiefs, assuming the rib issue doesn't provide too many complications. Cook corralled two of three targets for 20 receiving yards during Monday's 27-14 win against the Broncos. Cook caught two passes for 23 yards on five targets during Sunday's 30-16 loss to the Bengals. Analysis: Cook came crashing back to earth Sunday with a lackluster two-catch performance after combining for 14 receptions and 216 receiving yards in the Raiders' previous two games. Game flow should have aided in Cook's potential volume as the Raiders fell behind, 17-0, in the first half, but the tight end was still unable to rack up a meaningful stat line. The 31-year-old will look to get back on track Week 16 against the Broncos on Monday night. Cook brought in seven of 10 targets for 116 yards in the Raiders' 24-21 win over the Steelers on Sunday. Analysis: Cook paced the Raiders in receptions, receiving yards and targets, putting together his second consecutive 100-yard effort. The 10-year pro continues to be a favorite target of Derek Carr all over the field, and the chief blemish on his performance Sunday was that he saw his three-game touchdown streak come to an end. Cook will look to continue his stellar late-season production versus the Bengals in Week 15. Cook caught seven of eight targets, collecting 100 yards and one touchdown during Sunday's 40-33 loss to Oakland. Cook caught two of five targets for 32 yards and a touchdown during Sunday's 34-17 loss to the Ravens. Cook corralled three of six targets, putting up 31 receiving yards and a touchdown during Sunday's 23-21 win against Arizona. Cook caught four of nine targets for 52 yards in Sunday's 20-6 loss to the Chargers. Analysis: Cook has seen his production drop off immensely after what was a torrid start to the season by his standards. 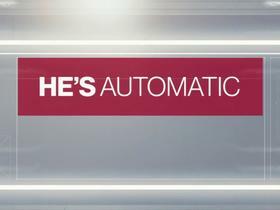 He entered the week with three games of 20 yards or fewer in his last four and seemed headed towards a similar fate in this one when he saw just two targets and recorded no catches in the first half. 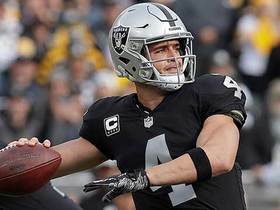 After hauling in four of his seven second-half targets to salvage his day, perhaps the Raiders will look to the 31-year-old more frequently starting Week 11 at Arizona. Cook brought in both of his targets for 20 yards in the Raiders' 34-3 loss to the 49ers on Thursday. Analysis: It was a positively pedestrian night for the Raiders' passing attack overall, and Cook's production suffered as a result. The veteran tight end has certainly proven capable of the occasional explosive outing this season, but his week-to-week upside remains partly capped by the inconsistent play under center. Cook now has a pair of two-catch tallies over his last three games, and he'll look to up his numbers versus the Chargers in a Week 10 divisional battle. Cook caught four of five targets for 74 yards and a touchdown in Sunday's 42-28 loss to Indianapolis. Analysis: So much for cooling off. Cook got back to cooking, scoring his third touchdown of the season while leading the team in receiving yards. 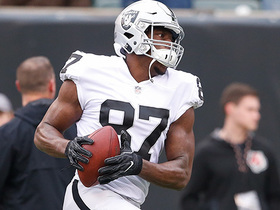 The veteran tight end has never found paydirt more than five times in any of his previous nine NFL seasons, but he has a chance to eclipse that mark this year on a Raiders offense that doesn't boast many other weapons in the passing game. He'll face the 49ers on Thursday in Week 9. Cook recorded two receptions for 10 yards, as the Raiders fell to 1-5 with a 27-3 loss to Seattle on Sunday. Cook caught four of six targets for 20 yards in Sunday's 26-10 loss to the Chargers. Cook caught eight of 13 targets for 110 yards and two touchdowns during Sunday's 45-42 overtime win over the Browns. Cook reeled in five of six passes for 31 yards in Sunday's 28-20 loss to the Dolphins. Analysis: Cook was active in the Raiders' short-passing game as he averaged 6.2 yards per catch, while amassing more receptions than receivers Amari Cooper and Martavis Bryant combined. Cook has totaled 18 catches for 260 yards on 22 targets through the first three weeks of the season and was on the field for 82 percent of Oakland's offensive snaps against the Dolphins. Cook reeled in all four of his targets for 49 yards in Sunday's 20-19 loss to Denver. Cook turned 12 targets into nine catches for 180 yards in Monday's 33-13, Week 1 loss to the Rams. Analysis: Cook was the lone bright spot in what was an otherwise dismal performance from Oakland's passing game. Receiving back Jalen Richard added 55 yards on nine catches of his own, but no other Raider had more than three catches or 23 yards. If this is what Oakland's offense looks like every week under new coach Jon Gruden, it won't be long until Cook's universally owned in fantasy. Cook caught two of three targets for 24 yards in Friday's preseason game against the Packers. Analysis: Coach Jon Gruden hasn't given his top players much run during the preseason and likely will hold them out for the final exhibition contest. Cook is locked in as Oakland's top pass catcher at tight end, but he'll probably cede some snaps to blocking specialist Lee Smith in running formations. Cook draws a Week 1 matchup against a Rams defense that was middle-of-the-pack in production allowed to tight ends last season. Raiders coach Jon Gruden said he's been surprised by Cook's speed, Scott Bair of NBC Sports Bay Area reports. Cook, who caught three passes on four targets for 35 yards in Sunday's 30-10 loss to the Chargers, wrapped up his 2017 campaign with 54 receptions (on 86 targets) for 688 yards and two touchdowns in 16 games. Cook (wrist) does not carry an injury designation for Sunday's game against the Chargers after practicing fully Friday. Analysis: Cook will be out there if you need him Sunday, but he's been a hit-or-miss fantasy option of late, combining for three catches for 32 yards over his last two games. Meanwhile, he's logged just one outing with more than two catches since Week 11. Cook (wrist) was a limited practice participant Wednesday, Michael Gehlken of the Las Vegas Review-Journal reports. Analysis: Cook played through the wrist injury in Monday's 19-10 loss to the Eagles, catching one pass for 15 yards on two targets while logging 75 percent of the snaps on offense. He compiled 290 yards in Weeks 7-9, but he's recorded just one outing with more than two receptions in six games since a Week 10 bye. Cook made one reception for 15 yards on two targets in Monday's 19-10 loss to the Eagles. Analysis: Cook, who was bothered by a wrist injury earlier in the week, played just eight more snaps than fellow tight end Lee Smith. The latter caught two passes on three targets for 16 yards, slightly outperforming Cook in PPR formats. Cook's final challenge of the 2017 season will come against a tough Chargers defense that gave up just four catches on eight targets for 21 yards to Jets No. 1 tight end Austin Seferian-Jenkins in Week 16. Cook (wrist) does not carry an injury designation for Monday's game against the Eagles after being listed as a full practice participant Saturday. Analysis: Cook is coming off a two-catch, 17-yard effort in Week 15's loss to the Cowboys, but the hoped-for return of starting wideout Amari Cooper (ankle) could help free things up for Cook to a degree in Week 16. Giants tight end Evan Engram managed to rack up eight catches on 13 targets for 87 yards in his team's 34-29 loss to the Eagles last weekend. Cook (wrist) was limited at Thursday's practice, Vic Tafur of The Athletic reports. Analysis: Cook was limited in practice ahead of Week 15 as well but went on to suit up against the Cowboys. He was ineffective in that game, catching only two passes for 17 yards, but the point stands that his limited participation Thursday could very well be a precautionary measure. His practice sessions over the next couple of days will give a better indication of his availability for Monday's contest against the Eagles. Cook caught two passes on four targets for 17 yards during Sunday's 20-17 loss to the Cowboys. Cook (wrist) practiced fully Friday and doesn't carry an injury designation for Sunday's game against the Cowboys, David Helman of the Cowboys' official site reports. Cook (wrist) was limited at practice Wednesday. Analysis: More on Cook's status Thursday, but he could simply be managing his practice reps on the heels of a bounce-back effort in Week 14 against the Chiefs, in which the tight end saw action on 89 percent of the Raiders' snaps on offense, en route to logging five catches on six targets for 75 yards and a TD. Cook caught five passes on six targets for 75 yards and a touchdown in Sunday's 26-15 loss to the Chiefs. Cook hauled in just one of five targets for nine yards during Sunday's 24-17 win over the Giants. Cook is expected to be a primary target for quarterback Derek Carr in Sunday's game against the Giants, Matt Schneidman of The San Jose Mercury News reports. 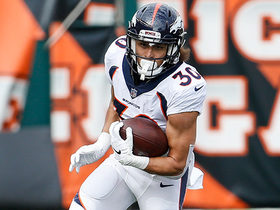 Cook caught just one of five targets for one yard during Sunday's 21-14 win over the Broncos. 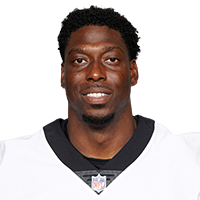 Analysis: Cook has now logged just three receptions on 10 targets for 37 yards in two games since the Raiders' bye week, coming on the heels of an impressive performance against the Dolphins in Week 9 when he racked up 126 yards on eight catches. He could see an uptick in looks from quarterback Derek Carr in Week 13 against the Giants, however, as top receivers Amari Cooper (ankle, concussion) and Michael Crabtree aren't locks to suit up at this point. Cook caught two passes on five targets for 36 yards during Sunday's 33-8 loss to the Patriots. 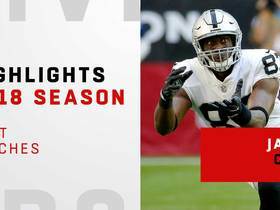 Analysis: Coming off his best performance of the year in which he racked up 126 yards on eight receptions against the Dolphins prior to the Raiders' bye week, Cook fell back to earth in Week 11 despite Derek Carr being forced to attempt 49 passes. Cook did play a role in the Raiders' longest play of the day, connecting with Carr on a 26-yard completion during the second quarter. Cook will look to find the end zone for just the second time all season in Week 12 against Denver. Cook caught eight of nine targets for 126 yards during Sunday's 27-24 victory over the Dolphins. 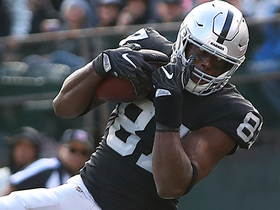 Watch the best catches from Oakland Raiders tight end Jared Cook of his 2018 season. 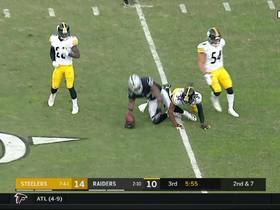 Oakland Raiders tight end Jared Cooks shows off vs. Steelers. Oakland Riders quarterback Derek Carr finds tight end Jared Cook for a 30-yard gain. The "NFL Fantasy Live" crew discusses which players stood out from Week 13 action. Oakland Raiders quarterback Derek Carr completes a deep pass to tight end Jared Cook to move up to second place on the franchise's all-time passing yards list. Oakland Raiders quarterback Derek Carr lofts it to tight end Jared Cook in the back of the end zone for a 24-yard touchdown.